I heard some terror suspect had been 'neutralised' on the radio the other morning - what'd they do turn him into an acid first? Last time I looked the only opposing force to life was death - so why not say killed if they mean killed? There is also the chance they enchased the suspect in carbonite. so it’s not just a merkinism for the act of rendering someone impotent? or were you looking for Pubic Add-dress? Either way the term is a figleaf. "But it doesn't stop there. The Department of Prime Minister and Cabinet (DPMC) has established the Greater Christchurch Group, which will take over Cera's responsibility for monitoring the recovery and provide policy advice to ministers and Government departments. On top of DMPC there will be other relevant ..."
shame that the new Australian subs can't hold that piece of information in their heads from one paragraph to the next! A minor cavil I know - but just one of far too many - One has to ask if Fairfax and their readers are being well served by these cost cutting 'improvements'? ...but it is evidence of rising 'c' levels amongst illiterate reporters and subs. 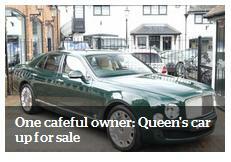 The Herald don’t need no stinkin literacy – justive for all. What I find astounding is that there is a significant proportion of the mistakes which will show up in a spell-checker. Justive gets a nice red wiggly line under it when I type it here - how come the headline writers don't get to see (or notice) something like that ? how come the headline writers don’t get to see (or notice) something like that ? Justive must be ‘c’ed to be believed? …then again, I found another couple of ‘climactics’ in a reputable science site article on climate, and spell checker won’t pick them up, only a rap on the knuckles reinforces that! What do you think about these six bullets points? What do you think about these six bullets? Please, before you create any communication be in website copy, a brochure, an advertisement, your next newsletter; before you send anything out – put your customers’ shoes on. 1. Have you eliminated the I’s, we’s? 2. Is it chock full of benefits to them? 3. Is it of interest to them? 4. Is it glorifying you. If so will they care? P.S. This applies on the personal explanation front to. Whoever put this together for them; along with whoever approved it; should be fired! Or at least severely reprimanded. The Herald has a decent little story on how much various degrees earn which shows that entering the preforming arts may not be the best idea. There’s nothing like a major media outlet blowing its our own trumpet… but what a pity they’ve mispelt the sponsor’s name. Twice. When it comes to proofreading, subs can never be too cafeful.The Herald manages to prove this on the front page of their site at the moment as well as in the headline and metatags of the story. Doh! Caféful – when a journo loses all literacy skills as the result of consuming too many lattés. Peru is as complex as its most intricate and exquisite weavings. I can find no evidence of Pura being another name for Peru. This thread is starting to turn into the wonderfully funny book we used to keep in The Press proofreaders room - which recorded the errors we stopped and also the ones we missed - in a special hall of shame. I wonder what became of that after the machines took our jobs. I see your Pura Ian, and raise you a rather large joint. 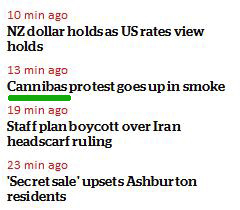 This 'latest' headline is prominent on the front page of the Herald site at the moment, and the linked story -- Cannibas protest goes up in smoke outside the White House -- has the same misspelling. The story is pulled from the Washington Post where the error doesn't exist, so the headline seems to have been rewritten locally for humour -- another classic Herald fail. Cannibas? Whatever are those Herald subbies smoking? Despite all their own shortcomings in this department The NZ Herald still makes a story out of the Met Service site having a few typos . Lest this becomes a bash the Herald thread, it’s worth mentioning that Newshub are equally capable of poor research and typos. TV3 ran this story last Thursday on Stonewood Homes coming back from liquidation under its new owners. Almost everyone in Christchurch would be aware of this story, but somehow former owner Brent Mettrick became “Merrick” (1:07) and the company was captioned (1:16) as “Stonewhood”. Basic errors like this would never have gone to air when Phil Corkery was the ChCh bureau chief. But alas, he disappeared in Weldon’s recent cleanout. …and Brian Rudman launches into an attack on The Nation’s piece on the history of some of our urban statuary and memorials, I suspect without watching the segment in question (and probably spurred on by an equally ill-conceived piece on the whale oil blag – it’s not a blog really is it) – nowhere in the Phil Vine TV piece do they advocate pulling these statues down, in fact they basically say what Rudman wants them to say – which is we should know who these people are and their stories so we learn from the past. Much posher now the company's been bought by infamous brothel owners, the Chow brothers. Although I note they're being referred to in the MSM lately as "property magnates". though OTOH, given our theme of inaccurate word use in the MSM, the journos might just think "magnates" means that their properties are more ... sticky? 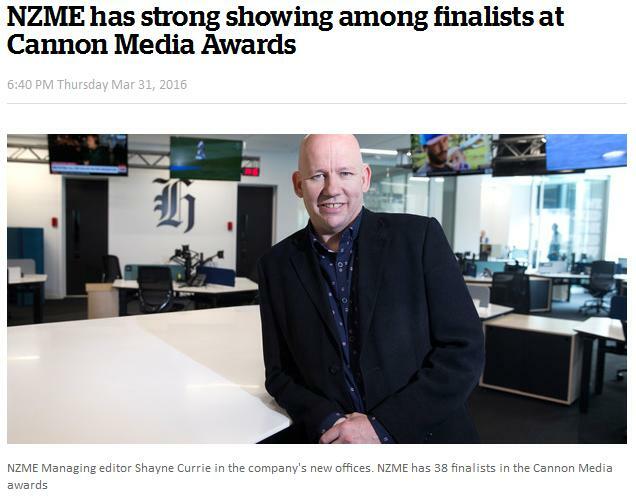 Meanwhile back at the NZ Herald slackness still rules the roost two of their ‘name’ columnists turn in poor work.. The word you're looking for is "with", Barry. How hard is it to read through your finished copy and spot the obvious clangers before they're published? Time to bring on the subs. Current lead story on the Herald website is ... just not news. In any possible way. Not recent, not relevant, not local, not - nothing. And not the first time, either. The SIS report conjures up images of Inspector Clouseau with his heavy moustache and deerstalker Sherlock Holmes hat. 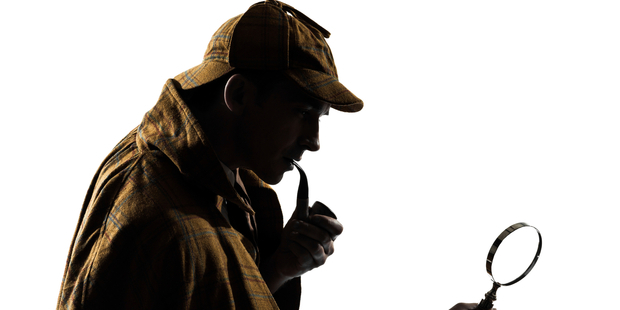 A stock photo of Sherlock instead of Clouseau.........?.